This is a companion file for the Canola Diagnostic Tool. The diagnostic tool asks questions to come up with a short list of potential causes for an observed problem in a canola field. The more questions you answer, the more refined the search. Going through this checklist ahead of time will make answering the questions easier and more accurate. 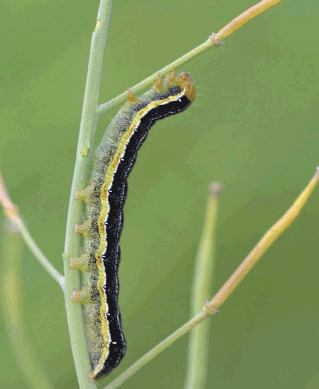 Canola faced a wide range of insect threats in 2012, and will likely host a wide selection of insects again in 2013. Effective insect management program includes the understanding that some level of insect presence is OK and can be economically positive when it comes to long-term management. An extensive article this month looks at insect thresholds, and why they’re an important part of spray decisions. Other agronomic topics: Blackleg management is about more than crop rotation. Seed decisions you make over the winter can influence green seed risk at harvest. Insect economic thresholds represent the break even point for an insecticide spray. Sticking to thresholds will also help preserve a vibrant and economically valuable population of beneficial insects that can naturally keep pest insect populations in the check. 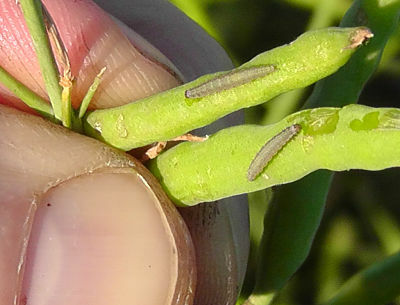 This article provides thresholds for all major canola insect pests. Growers can plan at this time of year to make sure they have enough seed purchased to achieve the target plant stand of 7-10 plants per square foot, which will provide a more uniform-maturing stand and a lower green count. Also, take note of the maturity ratings for each variety. “Read more” to get the answer key. To all who wrote and passed the exam between January 1 and January 31, check with Prairie CCA and make sure your 6.5 credits were applied to 2013 and not 2012. Space is still available for CanoLAB at the Keystone Centre in Brandon, February 28 and March 1. Growers and agronomists from outside Manitoba are welcome to attend, especially given that labs in Saskatoon and St. Albert are sold out. Read more to see canola related events upcoming over the next few weeks. Kristen Phillips returns from mat leave and Autumn Holmes-Saltzman is our new agronomist for Southern Alberta. This month, we say good bye to Derwyn Hammond and Angela Brackenreed.